1. Pick a template or create yours from scratch. If you go for the templates, you can still customize them, and you’ll be able to get a unique looking book, so don’t worry about that. There is a great selection of book templates to choose from either for free or at an affordable price. 2. Create your iBook cover: pick a cover picture for your book. If you don’t like what iBooks Author provides, you can also add your own artwork for the cover. Remember, cover is what readers see first as the book opens, so a nice custom cover image is always good to have to make your book stand out. Also, iBooks Author allows you to add an introductory video to your iBook which will start playing when the reader opens your book, so make your cover exceptional. 3. Now that you have the cover ready, it’s time to add some content to your iBook. 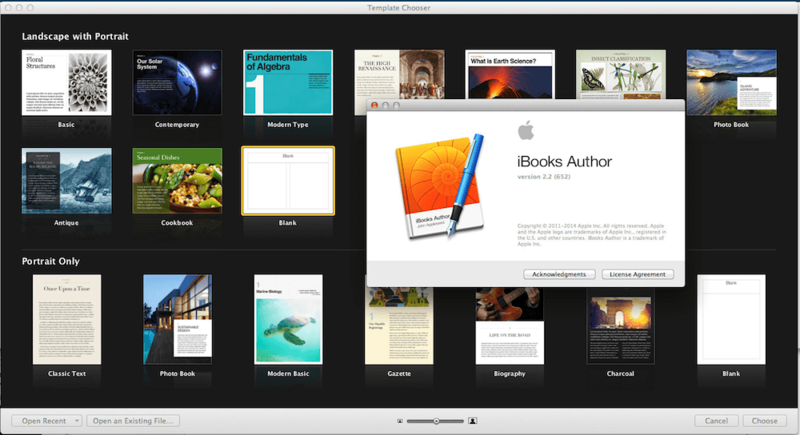 By using iBooks Author, you get everything you need to be able to create your book. You can create the Table of Contents, add a copyright notice, sections, basic shapes, interactive widgets, images and even a gallery. There are great tutorial videos with tips and tricks out there to get you started with iBooks Author just like the one below. iTunes Producer is the platform that allows you to upload your ebook to the iBooks Store. Don’t confuse iTunes Producer with iBooks Author, which is an Apple publishing software. To upload and publish your ebook using iTunes Producer you’ll need a Mac computer and a validated EPUB file of your ebook. Use it to provide Apple with all the required metadata for your book, such as title, publisher, original publication date, and so on. You can also use it to submit files such as the book file, sample file, book cover and screenshots for the iBooks Store. If you don’t have a Mac, don’t worry, an aggregator will publish to iBooks for you. You don’t have the hardware or software required to publish your ebook directly to iBookstore. Apple requires Mac OS X system. An ePub file is needed for submission to the iBookStore. You don’t know how to format the manuscript technically. An apple aggregator ensures that your epub file passes validation checks. Apple has a strict file validation process. All submitted files must pass EpubCheck. Apple has selected PublishDrive as an approved aggregator. Being a company trusted by Apple means merchandising opportunity and faster sale for publishers. Publish on iBooks with PublishDrive and get global reach for your books and professional help so you can focus on the most important job: creating excellent content. Offer your books for free and sell your books. After you decided which agreement you want to sign, you need to fill out a secondary contract and share with Apple directly your bank account and tax information. If you sell your books and live in the US, you’ll need to provide a U.S. Tax ID. You might know by now that you need an Apple ID to offer your books on the iBooks Store. If you don’t have an Apple ID, you can create one for free on iTunes. Enable your Apple ID for iTunes Connect and provide your publisher name and indicate whether you’ll be submitting your own books or submitting books behalf of a company. Offering your books on iBookstore is free. However, Apple takes 30% cut of whatever you make on iBooks. With an audience of over 800 million iPad users over a million customers every week, iBookstore is making a huge potential market for authors and publishers, so do not hesitate when deciding on publishing to iBookstore. And remember, if you need help, just submit your books through an aggregator such as PublishDrive.